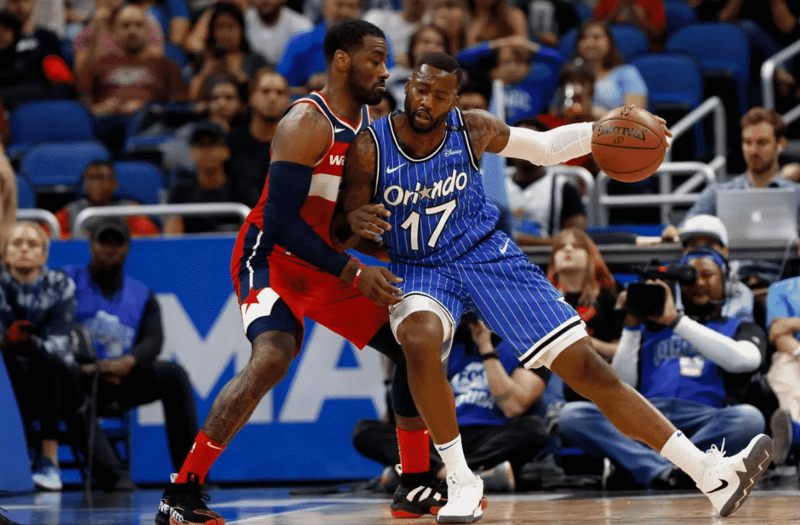 The Washington Wizards lost to the Orlando Magic 117-108 on Friday night. They are now 2-9 on the season. Once again, mistakes on the defensive end and rebounding cost them. Washington was hopeless for most of this game until there were two minutes left in the third quarter. The Wizards were down 25 with the Magic running away and then Scott Brooks finally did something for a change and put Jeff Green at center. Then, Washington had hope. They had trimmed the lead down to 14 and it was a 98-84 ballgame. The Wizards even had the lead all the way down to one. However, the Magic went on a 5-0 run after a three from DJ Augustin and an alley-oop finish from Terrence Ross, and that was all she wrote. The game ended in single digits but it was a lot closer than it should have been. Apart from Washington making that comeback towards the end, the Wizards were never truly in this one. Orlando pulled away early on and were basically jogging in the fourth quarter. Once again, poor defense and not much bench production caused Washington to lose, once again. And, against another poor team, the Wizards, with three max contract players, came up short. I’m running out of words to describe this situation. The entire thing is a huge mess. And it is always defensive mistakes. Notice how it says as a whole. There are a few exceptions to this rule. Jeff Green usually does his part and Kelly Oubre does his part but other than that, nothing. Satoransky and Rivers do nothing at the guard position. Mahimni and Smith cannot produce at the center position and the young guys never get their shot. This was supposed to be the deepest team the Wizards have had in the John Wall era and it has turned out to be the shallowest. Will Scott Brooks use smallball more often? Brooks closed the fourth quarter with Beal, Wall, Rivers, Oubre and Green on the floor at the same time. Yes, I know. That sounds awful. But it worked pretty well and managed to claw them back into the game. The only problem was once the game reached the last two minutes. When that happened, everything fell apart. The defending became poor again and Green as well as Rivers became defensive liabilities. That lineup works on some occasions but maybe go back to the starters to close the fourth out next time Brooks. However, he has the right idea—instead of an all-bench unit, play three bench plays with two starters. Stagger them. Give them breathers, but get them in quick. Will we see this strategy again? I don’t know. We were supposed to see Porter and Oubre playing together more, but we haven’t. We were supposed to get more Markieff Morris at center, but we haven’t. Brooks has been steady with what he’s chosen to play this season and it is one of the main reasons why the Wizards are so poor. He needs to try other kinds of lineups for this team to do better. He didn’t play in the fourth quarter and he only played 23 minutes total. That’s absolutely unacceptable. Porter, even if he isn’t touching the ball, is a floor spacer. He’s much better than Austin Rivers as a shooter—why not play him? Imagine if, as opposed to Rivers, he played Porter in that fourth quarter. That makes a huge difference. The lineup is small, but lengthy. Rivers is a defensive liability. Porter is worth putting in with the game on the line, and Brooks needs to be able to see that otherwise he should not be coaching this team. Who am I kidding? Ernie is probably going to extend his contract once I put this out. Maybe the Wizards pick it up against Miami. Or the game after that. Or never. Maybe the Wizards should tank for Zion Williamson? I honestly have no idea anymore. This team is an absolute disgrace and it is effecting everyone around the Wizards.